At the end of every academic year, a frantic purge reveals hidden treasures in each on-campus residence hall. Common spaces are piled high with whatever couldn’t fit into cars and suitcases. From cookwear to brand new clothes, students leave behind a wealth of resources after move out that AU students zero waste club and their sponsor, Helen Lee, MBA '16, resourcefully resold. 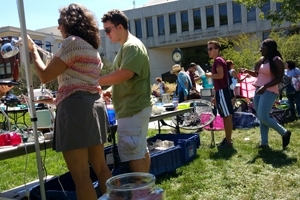 "The zero waste club president approached me and wanted to do something more with move out. AU already had program in place for donating, but why not sell it during move in because students always buy the same stuff," said Lee. Currently studying in the zero waste field, project move out sparked Lee's interest. "I love the fact that whatever I’m learning in my [MBA] classes I can apply in the workplace," said Lee as she helped organize project move out. Lee understood how stressful and expensive it could be for students to take or store belongings. "People aren’t thinking ahead. We understand that and that's why I think this program is so beneficial for the university and students," said Lee. Collecting, sorting and storing items proved to be a huge task for Lee and the 17 volunteers who helped over the summer. Weekends and evenings of hard work and help from AU facilities management paid off when the project move out's move in sale opened for business the same weekend freshmen arrived. Turnout surprised Lee and her team as students and parents bought nearly every salvaged item at heavily reduced prices. By the end of the sale, the club made about $6,000 and only donated the few things that didn’t sell. Keeping none of the profits, the club reinvested the leftover funds into next year's project move out sale and a conference scholarship. "It was really exhausting, but it was very successful," said Lee. "We are planning to use the funds to continue this project moving forward…and trying to start a scholarship to send students to the a zero waste conference in October." Lee and the club are already thinking ahead for next year's sale. They are planning on reaching out to other organizations on campus to work together and make next year's project move out an even bigger success.